Clothes and gadgets from the legendary English team, McLaren Mercedes, represented on the track by the World Champion, Jenson Button. The constantly high quaity and unique design for years have been a characteristic feature of all products offered in McLaren's collections. Clothes in the Replica series relate to the current colours worn by the team members. 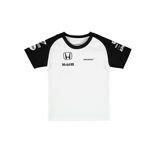 It is completed by a wide selecton of t-shirts, jackets and baseball caps designed with fans in mind to remind them of the team when outside the racing track - this is what the Signature series is all about. It discreetely combines elegance with the team logo.